Meningococcal infection is an acute infectious disease that is caused by neisseria meningitidis and is characterized by the variety of clinical forms: from nasopharyngitis and healthy carrying to generalized forms (meningococcemia, meningitis, and meningoencephalitis). Etiology: Neisseria meningitidis, Gram negative diplococci. · Source of infection - ill person or carrier. · Susceptibility is high in children 6 mouths -5 years old. Only 15% of contact persons may be infected, 98% of them become carriers, only 2% - ill.
More usual combined forms (meningitis + meningococcemia or meningoencephalitis + meningococcemia). 1. Inoculation and reproduction of bacteria in upper respiratory tract. 5. 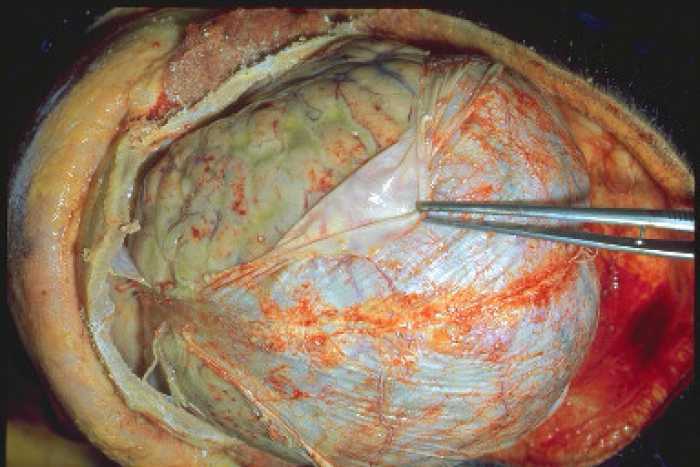 Rupture of hematoencephalic barrier meningitis, meningoencephalitis. · insignificant hyperemia of tonsils, soft palate, palatal arch, bright, swollen, covered by mucus back pharyngeal wall with hyper pleased follicles. · hemorrhagic syndrome (nasal bleeding, bloody vomits, hematuria). · Other features - irritability, myalgia, arthralgia and hypotension. · high lethality (at inadequate treatment). · Meningeal syndrome (meningeal pose, hyperesthesia, stiff neck, positive Kerning’s and Brudzinsky’s signs, tenderness in sites of trigeminal nerve endings, suppression of skin rephlexes). · Lethargy and obtundation usually develop and may progress to stupor or even coma. · Cerebrospinal fluid (CSF) examination show: -polymorphonuclear pleocytosis, protein enlargement, high pressure of CSF, glucose and chlorides are low decreased or normal. · Dyspepsia: coated tongue, loss of appetite, constipation. · Clinical investigation of CSF: neutrophyl pleocytosis, protein increase, positive Pandy test, elevated pressure, slight decrease of glucose level. · Serological IHAR, immunological methods, latex-agglutination test (presence of N.meningitidis antigens). Differential diagnosis for meningococcemia should be performed with measles, scarlet fever, pseudotuberculosis; thrombocytopenia, purpura fulminance, sepsis acquired by Gram-negative strains. For meningoencephalitis differential diagnosis should be performed with meningismus in influenza; spasmophylia; viral meningitis in influenza, measles; tuberculosis meningitis. 6. Antiseptic fluids locally (gurgling), ultraviolet insolation of the pharynx. 8. Transporting of patients with the severe forms of meningococcemia is carried out by the reanimation brigades of first-aid. 2. Providing of venous access. At fulminant forms MI must be provided 2 venous accesses simultaneously. 3. At presence of refractive shock, progressive increase of intracranial pressure, cramps – intubation of trachea and acquired pulmonary ventilation. 4. Infusion therapy by salt solutions, by colloid solutions for blood circulation stabilizing. 7. support of hemodynamics in case of refractive shock (dopamine, Dobutaminum, epinephrinum, norepinephrinum). 8. Purposeful correction of acid-basic balance and water-electrolyte disorders. 9. At presence of signs of adrenal insufficiency and/or refractive to adequate doses of sympathomimetics – Glucocorticoids intravenously. Preparation of choice is hydrocortisone as daily infusion or every 6 hours. 10. Treatment of hyperthermia (paracethamol, Ibuprofen, methamisol sodium, physical methods of cooling). 11. Anticonvulsant therapy (diazepam, sodium oxybutiratis, barbiturates, phenitoin). • at the terms of stable hemodynamics manitol and furosemid injection. At estimation by the Glasgow scale more than 8 points – the lethality forecast is 73 %. At estimation by the Glasgow scale more than 10 points – lethality forecast – 87.5 %. Intravenous infusion of cefotaxim or ceftriaxon. At mild and moderate forms of meningococcemia benzylpenicillin is possible (reserve antibiotics are ampicillin, ceftriaxon, cefotaxim or chloramphenicol), in case oh hypersensitivity to beta-lactams chloramphenicol is used. For protecting from a nosocomeal infection (if necessary) the second antibiotic should be given (amikacin 15 mg/kg/day, nethylmicin – to the children before 1 year 7.5-9 mg/kg, to the elder children – 6-7.5 mg/kg). Duration of antibacterial therapy at MI is 7-10 days. • Solutions are entered intravenously, stream. • Isotonic crystalloid solutions (sodium chloride, Ringer’s solution, sodium chloride + potassium chloride + calcium chloride dehydrate + sodium lactate) are entered in a dose 20-30 ml/kg during the first 20 minutes. • Colloid solutions (derivates of hydroxethylen starch of ІІІ generation) are entered with the speed of 20-40 ml/kg/hour. • In case of ITSH immediate infusion of crystalloid solutions 20 ml/kg during the first 20 minutes with subsequent infusion of colloid solution in a dose 10-20 ml/kg in next 20 minutes. • In case of fulminant forms of MI it is expedient to connect crystalloid and colloid solutions in correlation 2:1. • If infusion 60-90 ml/kg of salt solution or 20-40 ml/kg of colloids during the first hour of treatment appeared uneffective, then in such cases there is a necessity for application of sympathomimetics and respirator support. • Stimulation of urination by saluretics in case of oliguria, anuria – (furosemide 1-2 mg/kg) expedient only in case of hemodynamics stabilizing (satisfactory perfusion, arterial pressure, central venous pressure). • Application of glucose solutions, especially water is impermissible in case of ITSH, metabolic acidosis and cerebral edema. They do not stay too long in the vessels, strengthen the edema of cells, brain edema. Water solutions of glucose can be appointed only after stabilizing of hemodynamics, normalization of perfusion and liquidation of acidosis. By the unique testimony for infusion of glucose for patients with shock and head cerebral edema there can be hypoglycemia. The level of glucose must be supported within the limits of 3.5-8.3 mmol/l. At the level of glucose less than 3.5 mmol/l the correction by 20-40 % glucose solution is used, at the level over 10-11 mmol/l – insulin. • Metabolic acidosis is corrected by intravenous infusion of sodium bicarbonate at blood pH below 7.1-7.2. • Infusion therapy must remove electrolyte disorders also (hypocalcaemia, hyperkalimia, hypokalimia). • Meningitis is not an in indication for IV therapy limitation in case of effective hemodynamics maintenance. • After shock liquidation protracted infusion therapy is need. • The calculation of volumes for infusion therapy is done on the basis of physiologic necessity, correction of deficits of water and electrolytes, taking into account pathological losses, level of glucose, general albumen, state of alimentary canal, and degree of cerebral edema. • One of aspects of infusion therapy there is a necessity of partial parenterally feed in after shock period. Its basis is infusion of 10-20 % glucose solutions with insulin and amino acids solutions. Sympathomimetic and inothrope support of hemodynamics. • Application of inothrope preparations for children with refractive to infusion therapy shock – dopamine as permanent intravenous infusion 10 мcg/kg/min, if ineffective – increase the dose to 20-30 мcg/kg/min. At decreased cardiac output Dobutaminum is appointed in the same doses, as dopamine. • If, without regard of dopamine administration in the dose of 20-30 мcg/kg/min, hypotension is saved, expedient is application of norepinephrinum or epinephrinum from 0.05 to 3мcg/kg/min. If dopamine is ineffective quite often it is succeeded to obtain the substantial improvement of hemodynamics by the combined application of Dobutaminum and norepinephrinum. • Glucocorticoids are appointed at presence or suspicion on acute adrenal insufficiency and/or refractivity to the sympathomimetics. • Hydrocortisone is a medicine of choice. Possible is prednisolone application. • Preparations are entered every 6 hours. • The calculation of dose is done by prednisolone 10 mg/kg. Glucocorticoids are appointed as adjuvant therapy of purulent meningitis. Dexamethazonum is a medicine of choice 0.15 mg/kg х 4-6 times per day during 2-4 days. • Therapy of DIC-syndrome assumes administration of heparin in a dose 50-200 EU/kg per day, under control of coagulogram indexes. • At presence of hypercoagulability a dosage is applied to 150-200 EU/kg, that in combination with infusion, antibacterial and antiagregant therapy lead to the rapid normalization of coagulogram indexes. • The criterion of efficiency of heparin therapy is lengthening of coagulation time in 2-3 times from an initial index. • In transitional and hypocoagulation phases of DIC-syndrome fresh-frozen plasma in a dose 10-20 ml/kg as a fast, stream infusion in combination with heparin in a dose 25-50 EU/kg is applied. If necessary plasma is entered again. • The criterion of such therapy efficiency is an increase of fibrinogen level to 1.5-2 gs/l, prothrombine index increase over 60 %, stopping of mucosal bleeding, and bleeding from the places of injections. • In phase of incoagulability and fibrinolysis the inhibitors of proteases are given: contrical in a dose of 1000 EU/kg, and other in equivalent doses. • For warning of translocation of intestinal microflora at the severe forms of meningococcemia early tube enteroalimentation have to begin at once after stabilizing of hemodynamics, in absence of enteroplegia displays. • In the beginning of infants feeding optimal is application of lactose-free formulas which also contain prebiotics. • Formulas can be entered through a nasogastric tube. • Infants who have breastfeeding will achieve pasteurized breast milk. • At meningococcemia is needed a careful care of skin, prophylaxis of bedsores, treatment of skin by antiseptic fluids. • At presence of deep skin and soft tissues defects there can be necessary a necrectomy and plastic closing of a skin defect or amputation of distal segments of extremities. • Expedient treatment of necrotizing surfaces by antiseptic aerosols, creams which contain silver sulphodiasinum. • Carotinoids applications speed up cicatrisation of necroses. • Not deep necroses heal over independently and do not need treatment. • At arthritis – NSAIDs, warm on joints, massage, gymnastics. • At iridocyclitis – nicotine acid, nitrate of sodium in a temporal area. • At pneumonia – combination of antibiotics, oxygenation, physiotherapy. • At carditis – bed rest, cardiac glycosides, cardiothrope medicine. • with one documented negative nasopharyngeal culture which is performed in 3 days after antibiotic therapy. Dispensarization for 2 years by paediatrician, in case of meningitis, meningoencephalitis – also neurologist. 1. Current therapy in pediatric infectious diseases – 2 edited by John D. Nelson, M. D. – B.C. Decker inc. Toronto, Philadelphia, 1988, - P. 134-138, 285. 2. Ambulatory pediatric care (edited by Robert A. Derchewitz; - 2 nd ed. – Lippincot – Raven, 1992. – P. 570-574; 255.